Snowshoe hiking enthusiasts love a winter holiday in Vorarberg. Especially around your hiking hotel, the Kristberg Panoramagasthof in Silbertal, there are gorgeous landscapes of light, snow and ice opening up in front of you, even away from the prepared paths. On the Kristberg and the Bartholomäberg you can choose between 15 sign-posted snowshoe hikes with more than 120km. The snowshoe trails starting in Kristberg and Silbertal offer you a unique natural spectacle left and right of the the path as well as wonderful views over the remarkable peaks of the Austrian Alps – the Rätikon, the Verwall and the Silvretta mountain range, the Lechtal Alps and many other majestic mountains are waiting for snowshoe hikers in the Montafon. Easy-Peasy: Is this your first snowshoe hike? Beginners best start with one of the many short and easy tours, like the small circular walk around the Kristberg cable car mountain station. It takes about one hour and the path is quite flat over a length of 2.3km. The perfect hike for a start. Relaxed snowshoe enthusiasts: if you prefer a more advanced hike, try the Silbertal circular walk. Start in Silbertal and within 2.5 hours you will leave 9km and an altitude difference of 300 metres behind you. On this circular trail you will cross rugged passages and the Bannwald Bridge to Fellimännle. Take the same route back to Silbertal centre. Experienced mountaineers: For experienced snowshoe hikers we recommend a tour to the Mutjöchle, given that the snow situation is safe. Plan about 4.5 hours for this sportive tour over 12 km and an altitude difference of 632 metres. The tour starts at the Kristberg cable car mountain station and leads through the Muttwald forest and up to the Muttjöchle at 2,074m. Enjoy the impressive and unforgettable views from up there over the Rätikon, the Verwall and the Silvretta mountain range, before you head back directly to the Kristberg Panoramagasthof. Find further tour recommendations on our blog. Our reception team also has great hiking tips especially for the area around your hotel in the Montafon. Snowshoe hikers benefit especially from our membership at the Montafon Aktivclub. Our guest save 50% on guided snowshoe hikes by BergAktiv. 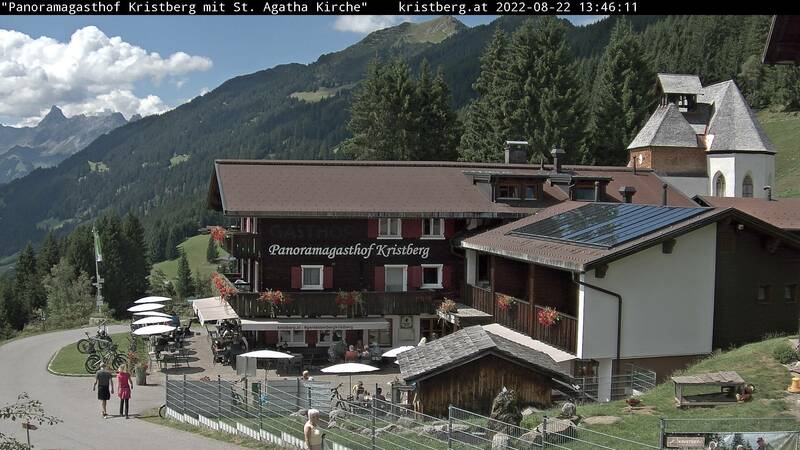 But there are further advantages waiting for you on the Kristberg, you can find them all on the Montafon Aktivclub website. Fancy a snowshoe hike on the Kristberg? Send a no obligation holiday enquiry conveniently to your indulgence team in Vorarlberg of make a reservation for your room at the Hotel in the Montafon with positive energy online. Why not take a look at our snowshoe package deals?